NASA Awards - Universe Galaxies And Stars Section. NASA Pushes the Limits with New Awards. NASA's Institute for Advanced Concepts has selected 12 proposals for further study as part of its goal of finding revolutionary ideas that could help the agency's plans for human space exploration. Proposals selected as part of Phase 1 will receive $75,000 for a six-month study. Those selected for Phase 2 will have two years and $400,000 to further develop their concept. 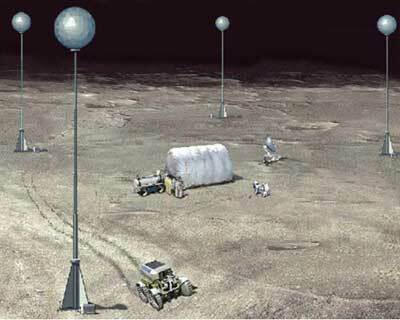 Some of the Phase 1 winners include an Infrared observatory on the Moon, lunar space elevators, electrostatic radiation shields and a plasma propulsion system. The NASA Institute for Advanced Concepts (NIAC) has announced its 2004 Phase 1 awards. Twelve proposals to boldly go beyond the frontiers of Space exploration were selected for a six-month study period beginning in October 2004. The NIAC was created in 1998 to solicit revolutionary concepts from people and organizations outside the agency that could greatly advance NASA's missions. The proposals push the limits of known science and technology. The proposals are expected to take at least a decade to be fully realized. NIAC's intention is to discover ideas that may result in beneficial changes to NASA's long-range plans. "We are thrilled to team up with imaginative people from industry and universities to discover innovative systems that meet the tremendous challenge of Space exploration and development," said Dr. Robert Cassanova of the Universities Space Research Organization (USRA), and NIAC director. The USRA runs the Institute for NASA. The NIAC sponsors research in two phases. Proposals selected for Phase 1 awards typically receive up to $75,000 for a six-month study that validates the viability of the concept and identifies challenges that must be overcome to make the proposal a reality. The results of the Phase 1 studies are evaluated. The most promising are selected for further research into the major feasibility issues associated with cost, performance, development time, and technology through a Phase 2 award. Phase 2 studies can be up to two years long and receive as much as $400,000.